Titan watches make popular gifts during weddings and anniversaries, thanks to their striking designs and efficiency, however picking the right watch can be harder than it might seem! Gifting Titan e-gift cards are more thoughtful as you give the pleasure of giving the gift to the recipient , making the entire act of purchasing simpler! By providing Titan e-gift cards to your Mom or Dad, you can please them to no end and let’s face it – their idea of a good watch might be very different from yours, so why not give them the freedom to choose? 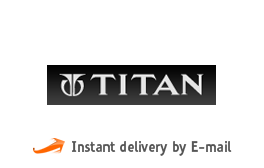 Titan e-gift cards can be used in all their outlets and there’s no limit to what a person can buy through such cards. If the credit value runs out during a purchase, the remaining amount can always be paid in cash or a credit card. Validity : 6 Months from the date of issue. 1. This e-gift card can be redeemed for Titan brands only at the WOT outlets. 2. This e-gift card is not valid on purchase of Fastrack, Sonata, Zoop and Nebula watches. 3. This e-gift card can neither be redeemed for cash or credit nor would any unutilized balance be refunded. 4. If this e-gift card is lost or stolen (used by someone else), it will not be issued again.